Aguilar de Campoó, home to amazing old churches, is also nicknamed Cookie Town. Yes, really: for many years Aguilar was home to the classic “María Fontaneda” cookie, a round cookie sort of like graham crackers but less crumbly. “Marías” are now made elsewhere by another company, but the cookie type is such a classic that the cookie name “María” is almost synonymous with round, brown breakfast cookie for dunking in milk. Though Fontaneda* is gone from Aguilar, two other huge cookie factories still manufacture in the town (Siro and Guillon). For a more home baked cookie experience, the nuns at Santa Clara monastery make a wide variety of cookies and other sweets, and there’s a good pastry shop in the Plaza de España, very near San Miguel church. Santa Maria la Real monastery, mostly Romanesque style, on west edge of town. This was one of the wealthiest and most powerful monasteries in the area for a long time, with some ups and downs due to secular and religious politics. After the mid-19th century expropriation by the state it was abandoned and basically dismantled. Almost in ruins, there were several unsuccessful attempts to restore it, finally in the late 1970’s a private group got the rehab going. Today it is part hotel (see below), part local high school, part museum and part center for Romanesque studies. 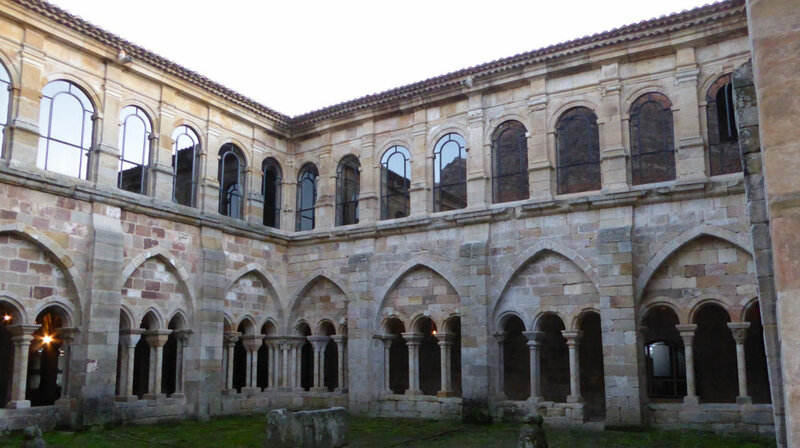 The museum includes a fabulous old cloister (photo above), the old chapter house and the church, with various models of Romanesque churches in Palencia province, some cleverly designed to open and view the interior. Alas, the museum information is not shown in English. Odd schedule to fit into the main use as a school, but they have several guided tours each day. Santa Cecilia church, Romanesque style, on the hill above town just below the castle. Lovely, simple lines inside and out. Inside: look for the Massacre of Innocents column capital, to left of main altar. San Miguel church, mostly Romanesque and Gothic style, in main square. Santa Clara monastery, only the Gothic chapel as the rest of the convent is cloistered. If you want cookies, you buy them through a lazy-susan and screen arrangement so you never see the nuns. See end for website with times to buy the cookies. Castle ruins, on hill above town. Mostly 14-15th c, on site of earlier fortress. The climb looks imposing but it’s not so bad and the view is nice. Town walls: the lower town was surrounded by a separate ring of walls, today we can see six city gates (best gates for photo ops are Reinosa, Tobalina, Paseo Real and San Roque) and a short stretch of the old wall by the Paseo Real gate. Various for walk-by or strolling: Palaces with carved coats of arms on the façades. Plaza de España, a typical Castilian main square, fully lined with arcades and lots of typical bars or cafés. (ummm had a wine in one for 50 cents!). Riverside walkway and Isla park, nice walkway on south side of river and part of north side, pretty park on an island in the middle of the river. The area is just packed with Romanesque churches, supposedly more than any other equivalent area in Europe. That’s partly because in the centuries for building Romanesque architecture (11-13th) this area was important as border between Muslim and Christian Iberia; as history’s main events moved south it became a poor backwater without resources to tear down and replace the old churches. Take your time exploring, if you like history and architecture you will probably want to come back. Santa María de Mave: Romanesque church of an old monastery, closed in the the 19th century expropriation. Lovely church, well worth a visit but with a quirky schedule, depends on time of year and day of the week. Ask for help at Aguilar tourism office to arrange a visit. The old monastery is now a small hotel, open April to November (see below). Near Mave, about seven kms south of Aguilar. Santos Justo y Pastor: cave-church, probably 8-9th c, enlarged 12th c. This area has a number of cave-churches, this is one of the larger ones. Another church well worth a visit but with equally quirky schedule, though this one seems to be open more than than Mave. In Olleros de Pisuerga, about five kilometers south of Aguilar. Mount Cildá castro, hilltop fortress town. Spectacular and easily defendable site, this village was inhabited off and on from the first century BC to 8th century AD by Celts, Romans and Visigoths. Excellent lookout for the entire area, and right over the Horadada canyon (see below). Near Olleros de Pisuerga, about a 45 minute walk, unpaved road from bridge over the Pisuerga at edge of Olleros, sign showing Castro de Monte Cildá. Loop option for experienced walkers: a much smaller, semi-marked trail starts at front door of the cave church, intersecting with the unpaved road at signpost for the fortress-town, go by the path and return on the road for a loop route. Interesting churches a little farther away: Santa Maria de Valverde cave-church, about 30kms east of Aguilar in Valderredible / Polientes, considered the best of the area’s cave churches. San Salvador de Cantamuda Romanesque church, about 35kms upstream following the Pisuerga river. Natural sights: The Horadada or Pisuerga river canyon is just southeast of town, excellent view from Mount Cildá, the train track goes through the canyon, too. The Tuerces near Villaescusa de las Torres, about six kms southeast of Aguilar, an area with limestone rock formations similar to the Torcal park near Antequera (near Málaga) or the Enchanted City (near Cuenca). Large reservoir about two kilometers west of Aguilar, has picnic and swimming areas. Cueva del Cobre, cave long considered to be beginning of the Pisuerga river; recent studies have proved that incorrect but the cave is still interesting, though not prepared for tourism. Near Santa Maria la Redonda, a little northeast of San Salvador de Cantamuda. Walking and biking: Two lesser-known Caminos go through the area: the Camino Olvidado and the Camino Lebaniego. Other shorter walking routes have been marked by Aguilar City Hall or the provincial government. There are lots of small paved and unpaved roads for biking. One good biking route is Pedaling the Romanesque (Pedaleando el Románico), a 60 kilometer loop around the reservoir that visits many towns with old churches. Where: Aguilar de Campoó is in the northeast part of Palencia province, a few kilometers from Cantabria and Burgos provinces. Getting there from Madrid: Alsa bus line, station in town. https://www.alsa.es/ Train, but look at schedules carefully as some departures transfer in Valladolid. Station a few kilometers from town, taxi is five euros. Bus service for departures / arrivals of slower Regional Express trains; those are the departures with transfer. http://www.renfe.com/ Both bus and train stops are on the way to Santander. Where to stay: in town, best is the Posada Santa Maria la Real, website: http://www.posadasantamarialareal.com/ A variety of other places in town are shown on tourism office website (my opinion: best to avoid Hotel Cortés Poza). Where to stay, nearby: Charming small hotel similar to the Posada in Mave, 6kms from Aguilar, only open April – November, website http://www.elconventodemave.com/ . Several other small hotels or casas rurales (b&b) within 10km radius of Aguilar. Local tourism office: http://www.aguilardecampoo.com/ Very helpful website. Town tourism office is on the riverside Paseo de la Cascajera, a little west of the Plaza de España main square. Also very helpful, their pamphlet-map is informative and well-designed. Tourism for Palencia province: https://www.diputaciondepalencia.es/sitio/turismo/ This province is relatively close to Madrid and has a lot to see; if you plan to drive to Aguilar, this website can help you decide on some cultural rest stops on your way there or return. (San Martin church in Frómista, San Juan de Baños church in Venta de Baños, just to mention ideas in keeping with the church theme of this post). There’s a provincial tourism office in Aguilar de Campoó, in the Plaza de España just to the left of San Miguel church as you look at church façade.